, the most celebrated of the family, was the son of Francis Turretin, and was born at Geneva, Aug. 24, 1671. From his infancy he shewed a great ardour for study, which his father took every pains to improve and direct. Some of his early preceptors were divines who had fled from France for religion, and one of them, a Mons. Dautun, was particularly serviceable in correcting the exuberances of his compositions, and habituating him to revise and reconsider what he wrote. This at first was rather troublesome to the lively spirits of our author, but he soon saw that Dautun had reason on his side. He studied the Cartesian philosophy under Chouet, a very able professor. 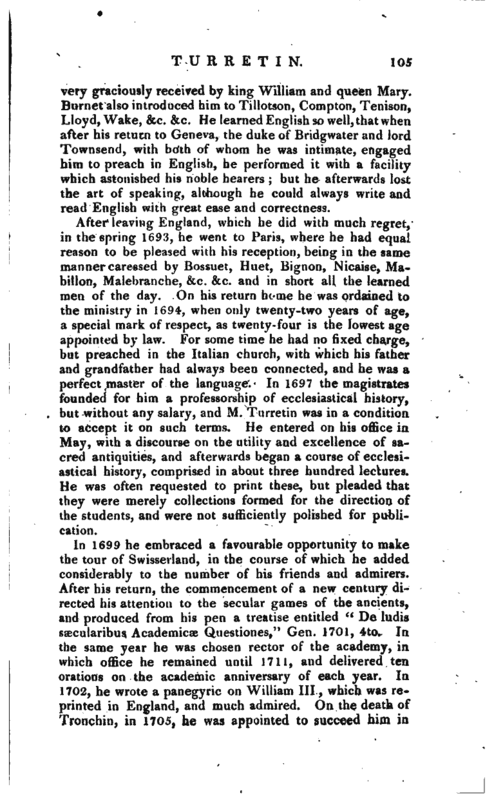 Bishop Burnet, who passed the winter at Geneva in 1685, conceived a very high opinion | of young Turretin, often examined him on his tasks, and in the course of many conversations inspired him with that taste which Turretin always afterwards indulged for English literature. In 1687 he lost his father, but continued to pursue his theological studies under Louis Tronchin, Calendrini, and Pictet. Tronchin admired in him a great love for truth and peace, and said, “that young man begins where others end.” Turretin had many advantages on his side, an uncommon share of natural understanding, a great memory, a facility in discovering the important parts of a question; an aversion to idleness and frivolous amusements; learned friends, an ample library, and a patrimony which set him at ease from anxiety or precipitation in his studies. At the age of twenty, with these advantages, we are told he was “almost a great man,” (presque un grand homme). In 16y3 he began his travels, and first resided for a considerable time in Holland, where his talents recommended him to the acquaintance and friendship of the most eminent scholars and divines of the time. He lived eight months at Rotterdam, and in the midst of the disputes between Jurieu and Bayle, was on good terms with both, without any sacrifice of principle on his own part. 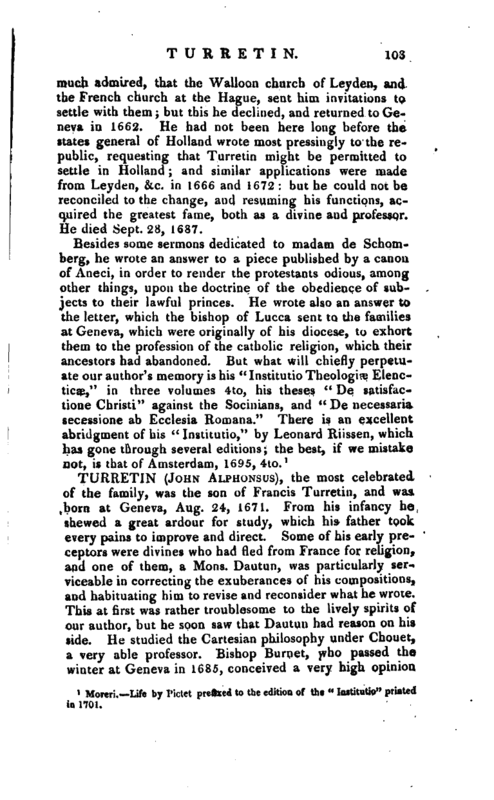 His chief object during his residence in Holland was the study of ecclesiastical history under Spanheim; and with that view he continued about eight months at Leyden, and maintained some theses which did him great credit, particularly “Pyrrhonismus pontificius, sive Theses Theologico-historicse de variationibus pontificiorum circa ecclesise infallibilitatem.” This was reprinted in the collection of his Dissertations. In July 1692 he came to England, but had not slept many nights in London before he was attacked by an asthmatic complaint, which disturbed him for the greater part of his life. He removed for better air to Chelsea, but preached in the French church in London, and visited the universities of Oxford and Cambridge. At the latter he first saw Mr. (afterwards sir) Isaac Newton, in whose modest manners and conversation he discerned the future illustrious character. It appears also that he held some amicable disputes with our divines on the respective constitutions of the churches of England and Geneva. He passed much of his time with his old friend bishop Burnet, at the palace at Salisbury, where he also met Dr. V/hitby and Mr. Allix: and by means of lord Galloway was introduced at court, and | very graciously received by king William and queen Mary. 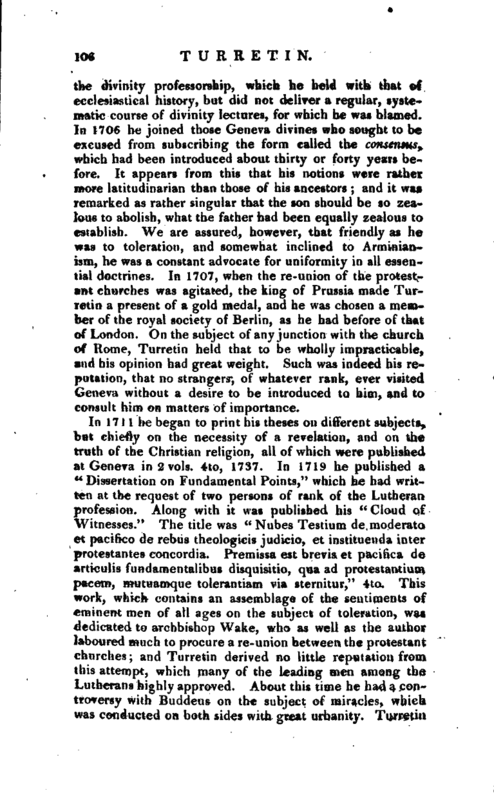 Burnet also introduced him to Tillotson, Compton, Tenison, Lloyd, Wake, &c. &c. He learned English so well, that when after his return to Geneva, the duke of Bridgwater and lord Townsend, with hoth of whom he was intimate, engaged him to preach in English, he performed it with a facility which astonished his noble hearers; but he afterwards lost the art of speaking, although he could always write and read English with great ease and correctness. After leaving England, which he did with much regret, in the spring 1693, he went to Paris, where he had equal reason to be pleased with his reception, being in the same manner caressed by Bossuet, Huet, Bignon, Nicaise, Mabillon, IVlalehranche, &c. &c. and in short all the learned men. of the day. On his return home he was ordained to the ministry in 1694, when only twenty-two years of age, a special mark of respect, as twenty-four is the lowest age appointed by law. For some time he had no fixed charge, but preached in the Italian church, with which his father and grandfather had always been connected, and he was a perfect master of the language. In 1697 the magistrates founded for him a professorship of ecclesiastical history, but without any salary, and M. Turretin was in a condition to accept it on such terms. He entered on his office in May, with a discourse on the utility and excellence of sacred antiquities, and afterwards began a course of ecclesiastical history, comprised in about three hundred lectures. He was often requested to print these, but pleaded that they were merely collections formed for the direction of the students, and were not sufficiently polished for publication. In 1699 he embraced a favourable opportunity to make the tour of Swisserland, in the course of which he added considerably to the number of his friends and admirers. After his return, the commencement of a new century directed his attention to the secular games of the ancients, and produced from his pen a treatise entitled “De ludis ssECularibus Academicae Questiones,” Gen. 1701, 4to.In the same year he was chosen rector of the academy, in which office he remained until 1711, and delivered ten orations on the academic anniversary of each year. In 1702, he wrote a panegyric on William III, which was reprinted in England, and much admired. 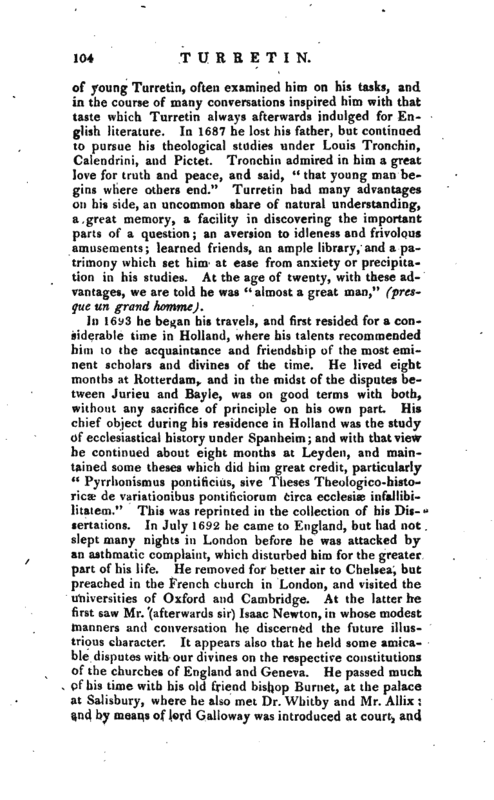 On the death of Tronchin, in 1705, he was appointed to succeed him in | the divinity professorship, which he held with that of ecclesiastical history, but did not deliver a regular, systematic course of divinity lectures, for which he was blamed. In 1706 he joined those Geneva divines who sought to be excused from subscribing the form called the consensus, which had been introduced about thirty or forty years before. It appears from this that his notions were rather more latitudinarian than those of his ancestors; and it was remarked as rather singular that the son should be so zealous to abolish, what the father had been equally zealous to establish. We are assured, however, that friendly as he was to toleration, and somewhat inclined to Arminianism, he was a constant advocate for uniformity in all essential doctrines. In 1707, when the re-union of the protestant churches was agitated, the king of Prussia made Turretin a present of a gold medal, and he was chosen a member of the royal society of Berlin, as he had before of that of London. On the subject of any junction with the church of Rome, Turretin held that to be wholly impracticable, and his opinion had great weight. Such was indeed his reputation, that no strangers, of whatever rank, ever visited Geneva without a desire to be introduced to him, and to consult him on matters of importance. In 1711 he began to print his theses on different subjects, but chiefly on the necessity of a revelation, and on the truth of the Christian religion, all of which were published at Geneva in 2 vols. 4to, 1737. In 1719 he published a “Dissertation on Fundamental Points,” which he had written at the request of two persons of rank of the Lutheran profession. Along with it was published his “Cloud of Witnesses.” The title was “Nubes Testium de moderate et pacifico de rebus theologicis judicio, et instituenda inter protestantes concordia. Premissa est brevis et pacifica de articulis fundamentalibus disquisitio, qua ad protestantium pacem, mutuamque tolerantiam via sternitur,” 4to. This work, which contains an assemblage of the sentiments of eminent men of all ages on the subject of toleration, was dedicated to archbishop Wake, who as well as the author laboured much to procure a re-union between the protestant churches; and Turretin derived no little reputation from this attempt, which many of the leading men among the Lutherans highly approved. About this time he had a controversy with Buddeus on the subject of miracles, which was conducted on both sides with great urbanity. Turretm | also began to prepare for the press his lectures on natural religion, which form an excellent system on that subject. On the death of Pictet he succeeded him in his duties on. solemn academical festivals, and in delivering the accustomed harangues, prescribed by the laws of Geneva, not only in the council of two hundred, but in the half-yearly meetings of the burgesses. He also took an active part in various improvements introduced by the church of Geneva, as a revision of their liturgies, a translation of the new testament published in 1726, the establishment of a society for the education of the young, &c. In 1734 he published his abridgment of ecclesiastical history, in Latin, “Historiae Ecclesiastics compendium a Christo nato usque ad annum. 1700,” Genev. 8vo. This he used to dictate to his students, and it served as a text-book for his lectures. The preceding year he received from our queen Caroline, who had often shewn him marks of respect, a gold medal, brought by Sir Luke Schaub, but she was dead before it arrived. 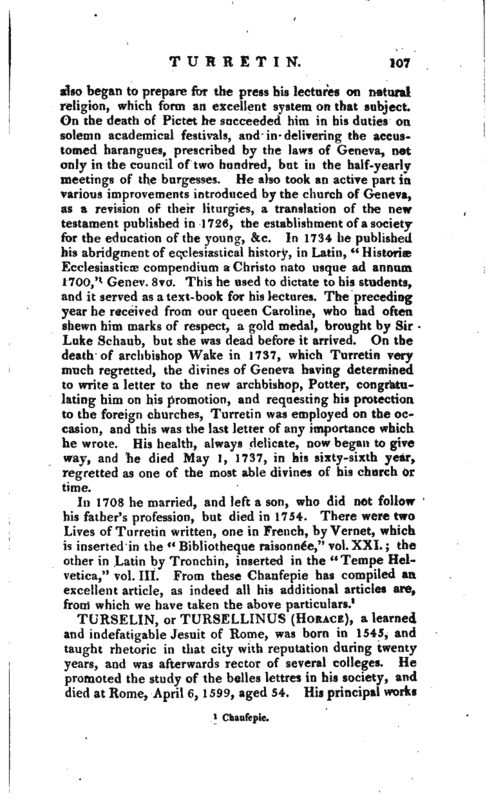 On the death of archbishop Wake in 1737, which Turretin very much regretted, the divines of Geneva having determined to write a letter to the new archbishop, Potter, congratulating him on his promotion, and requesting his protection to the foreign churches, Turretin was employed on the occasion, and this was the last letter of any importance which he wrote. His health, always delicate, now began to give way, and he died May I, 1737, in his sixty-sixth year, regretted as one of the most able divines of his church or time.